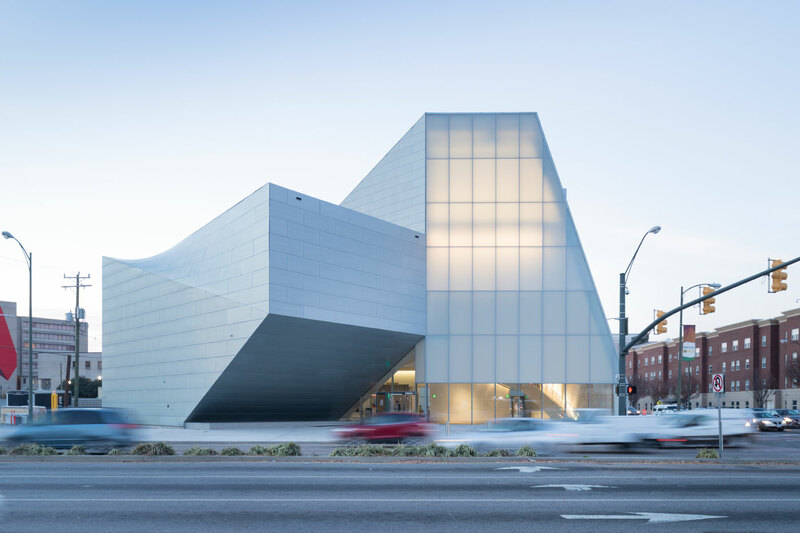 Ahead of its official opening on April 21, AN toured the luminescent Steven Holl Architects-designed Institute for Contemporary Art (ICA) at Virginia Commonwealth University (VCU) in Richmond. Though the ICA uses a simple material palette–zinc, raw concrete, translucent glass, and splashes of wood–it becomes more than the sum of its parts thanks to smart siting decisions that put natural light on display as much as the artwork. The concept of the past, present and future mingling together informed the “branching paths” shape of the building, the dual entrances (one towards the VCU campus and the other towards the city itself) and the finish details. In Holl’s own words, the building was conceived as a nexus between past and future, with “forking time” as the project’s central design tenant. Across the 41,000-square-foot space, each of the three gallery spaces, one on each floor, extend and rotate as they rise. From the exterior, the ICA can appear monolithic, as the distinction between its horizontal zinc panels and vertical frosted glass windows can disappear on cloudy days. At night the building glows from within and casts light from the ends of its rectangular volumes into the sculpture garden and the campus beyond. The project sits on the northeastern corner of VCU’s campus, both on top of the historic Elba train station and next to Richmond’s busiest intersection. That embodied kinetic energy extends to the building itself and into dramatic upward-flowing curves, whether in the 33-foot-tall Royall Forum at the entrance or the 33-foot-tall True Farr Luck capstone gallery that’s bounded by a swooping arch. Holl is obviously no stranger to designing light-filled art institutions; this year is the 20th anniversary of the semi-circular Kiasma Museum in Helsinki. As a result, the ICA is designed with exhibitions and flexibility in mind, from the terrazzo ground concrete floors to unfinished concrete-beam-ceilings, affording artists the chance to anchor pieces as they see fit. It’s impossible to separate the institution from the art on display within. The ICA will hold no permanent collection and will instead feature rotating shows of various sizes throughout the year. Not having to worry about how light would affect the art afforded Holl the opportunity to design around the natural daylight cycle, instead of creating diffused, even light throughout. The light from the skylights piercing the first and second-floor galleries ebbs and flows as the sun moves overhead. Many of the installations in the ICA’s inaugural exhibition, Declaration (an examination of how artists can address contemporary social issues), are arranged around these windows, using them as spotlights or for increased ambiance. Nowhere is this usage of light more prominent than in the top-floor gallery, which is sandwiched between a wall of glass on the western front and an elevated window on the eastern side. Besides the space’s enormous height, the most striking feature is how the sun moves from one window to the next over the day, creating a dynamically-lit space that sheds new light on the oversized installations within, depending on what time of day it is. The auditorium stands apart in its material palette, wrapped in cherry wood panels. The building also includes a sculpture garden and reflecting pool, and 8,000 square feet of greenery that covers three of the four gallery roofs. Sustainability considerations also factored heavily into the design, and the ICA is heated and cooled entirely through the use of 43 geothermal wells which radiate warmth up through the floor. The $41 million building is designed to attract passerby with its ground-level clear glass facade at ground level and the zinc-clad building volume lifting up over the entranceway. It also happens to take on new shapes depending on which direction it’s approached from. While it might seem imposing from the sidewalk, visitors will find an organic, constantly changing embrace within. Declaration will run from April 21, 2018, through September 9, 2018, and admission to the ICA is free. Like many universities situated in the heart of their communities, Princeton is grappling with the enormous challenge of growing its campus to accommodate new and expanded programs. Some of the strategies to expand include selective densification of the core and the renewal and repurposing of existing facilities. 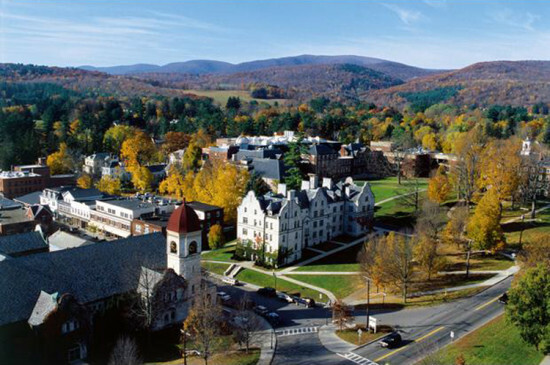 But longer range, the university will have few options but to expand at the periphery. While densification risks upsetting the delicate balance between buildings and open space that defines Princeton’s campus and grants it a majestic beauty, the ability to craft large swaths of land in the image of itself is also a welcome opportunity. Recent examples include the new sciences neighborhood at the campus’s southern border, where new buildings by Hopkins Architects and Rafael Moneo join a genomics facility by Rafael Viñoly, and an expanded engineering precinct at the campus’s eastern side, which just welcomed the new Andlinger Center for Energy and the Environment by Tod Williams Billie Tsien. Located on a 23-acre site at the campus’s western edge, the arts and transit neighborhood is an exercise in forging a more engaged relationship between the university and town with new arts facilities, a transit hall and rail station, and various eateries, including a Wawa. Planning the precinct was tasked to Beyer Blinder Belle Architects and Michael Van Valkenburgh, who were working with the university at the time on a ten-year plan to guide campus growth through 2016. Scheduled to be complete in 2017, the $300 million project is the largest expansion project in the university’s 265 year history. The new facilities inscribe themselves into the fabric of the campus by integrating the language of the neighborhood and surrounding courtyards in their form, scale, and materials. 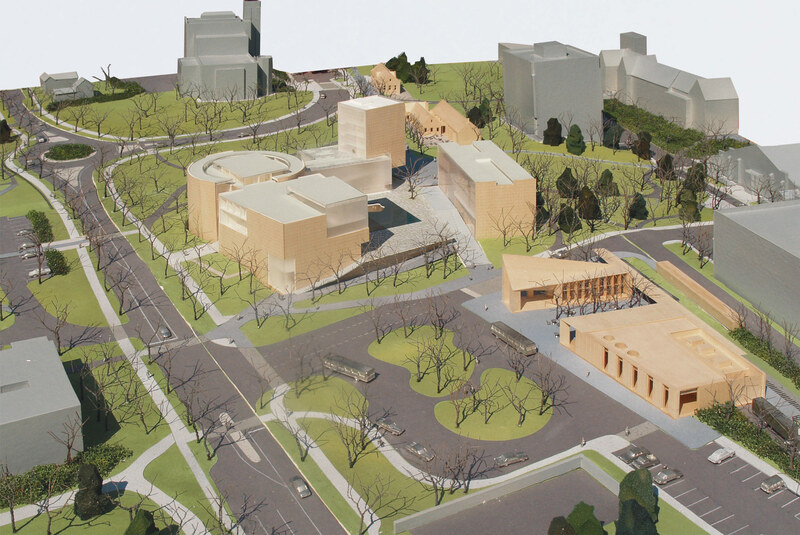 Steven Holl’s Lewis Center for the Arts anchors the precinct and creates a new campus gateway. It provides performance and teaching spaces for the theater and dance program, the department of music, and the arts in three buildings organized around a three-sided courtyard that opens to the community. In the center of the courtyard a shallow pool defines a main public space. The buildings’ Italian limestone exteriors reference the early stones and bluestone paving used elsewhere on campus. The arts tower is scaled to Blair Arch. Rick Joy’s transit hub creates a chapel-like space that is washed in natural light. One of Joy’s big place-making gestures was putting the transit hall and the Wawa in two separate buildings to shape a new public space. “We had a program for it and the Wawa but we never conceived of splitting it apart,” said university architect Ron McCoy. In addition to new facilities, the university is bringing in new infrastructure—reworking roads, creating plazas and circulation routes for pedestrians and cyclists, and providing for parking. Often, there's a blast of attention for the opening of a Biennial, or Biennale, or Triennale. This happens partly because the media descends on a place for the first few days while opening events abound, and then go back on their merry ways. It's also due in part to the event's programming—how much of note actually happens after the initial weekend? The Chicago Architecture Biennial, now over a month on, is bucking that trend by doing a great job of extending its initial burst of programming. AN was able to check in on the Biennial and see some of the ongoing, publicly engaging talks, lectures, exhibitions, and performances. And there were plenty. The trip started with a surreal performance by Jessica Lang Dance in collaboration with none other than New York architect Steven Holl. 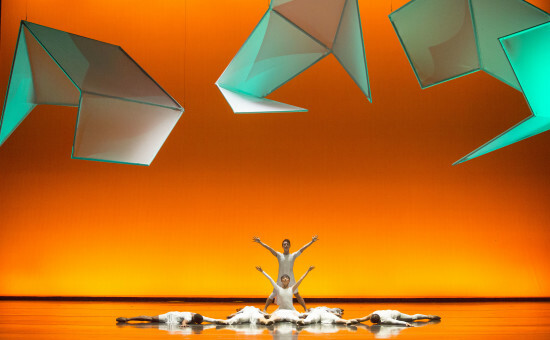 For 20 minutes at the Harris Theater on the northern edge of Millennium Park, Tesseracts of Time combined architecture and performance arguably the most potent way of all the Biennial's performances, as nimble bodies gracefully moved around and through stage sets designed by Holl. The most engaging parts of the Biennial are not necessarily the ones in the Chicago Cultural Center. Periphery events have a considerable range of programming, from environmental issues and Chicago-centric ones, to global questions of infrastructural inequality. The latter was on tap Saturday at "Architecture and Inequality," hosted by the history collective Aggregate. 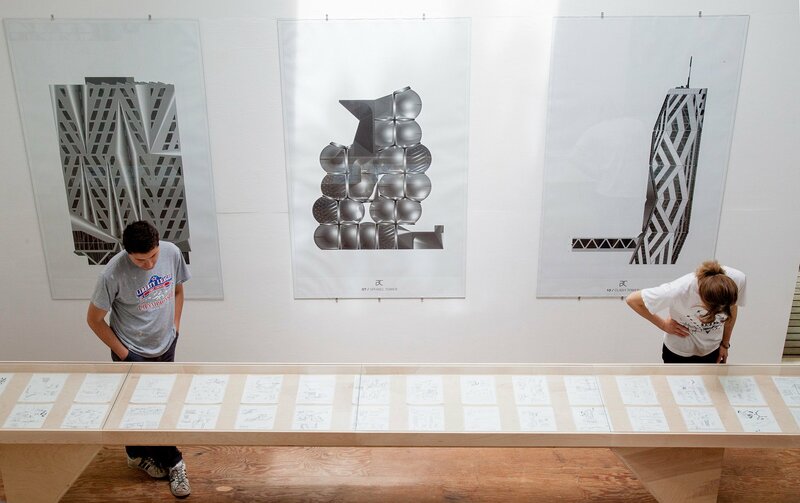 The six panels partly focused on extending the discussion from Aggregate's special issue "Black Lives Matter," which was a look at the structural challenges designers face when making cities and places for everyone. The discussions were surprisingly tailored to Chicago, and provocations from historians Meredith TenHoor, Sharon Haar, and Adrienne Brown were complemented by more contemporary presentations from Jonathan Massey and Emmanuel Pratt. TenHoor discussed infrastructure and inequality, using the unbuilt crosstown expressway in Chicago as an example of tangible inequality that galvanized a community—something that needs to happen today surrounding unequal urban spheres such as housing and transportation access. The panel was dynamic, illustrating the ways that architecture plays into uneven patterns of development and habitation in the city. At times, perhaps structural racism was over-conflated with economic inequality, but nonetheless the panels drew out the strong connections between the two. This is just one of many socially-minded panels that make the moralizing whiners sound silly when they complain that the biennial is not engaging with the city of Chicago and its unique urban problems. Switching gears very quickly, I headed to the standing-room only Chicago Arts Club to see legendary critic Bob Somol and his compadre Wiel Arets discuss with Geoff Goldberg the main exhibition of the Biennial. Somol is the former dean of the University of Illinois, Chicago, School of Architecture, while Arets is the dean of rival Illinois Institute of Technology. Goldberg is the son of Bertrand Goldberg. The three Chicago-marinated experts discussed the Biennial by choosing projects that caught their attention. Somol was especially taken in by Sou Fujimoto's submission Everything is Architecture and Atelier Bow-wow's Piranesi Circus. He compared Fujimoto's installation to Hans Hollein's Architecture is Everywhere. The Biennial's strength is in its breadth and sprawl, but on Saturday it became a weakness. 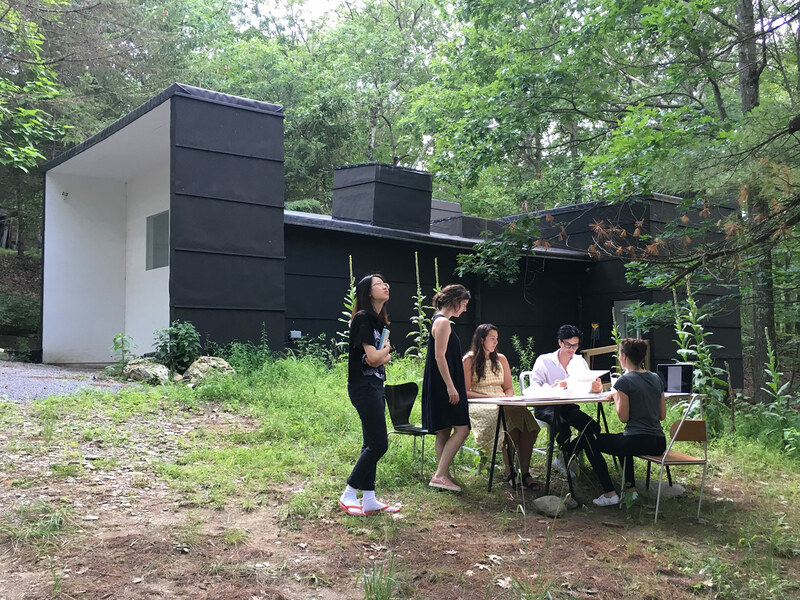 We couldn't make it to a very intriguing event, "House Practices", a discussion with Amanda Williams, Julia Sedlock, and Mejay Gula about their house-based practices. 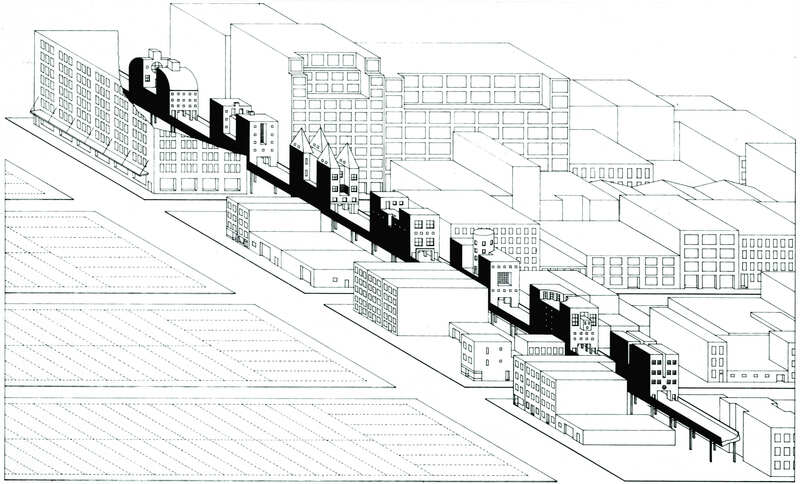 It took place far form the central loop, however, so I was not able to see it or the brilliant-looking exhibition also at the Elmhurst Art Museum, Lessons from Modernism: Environmental Design Strategies in Architecture 1925-1970. One of the more unusual things I heard when preparing for the Chicago Architecture Biennial (CAB) was a tip from someone involved that there was going to be "a ballet about Steven Holl." I was obviously excited about this prospect, and I finally got to see the final results last Friday. It may not have been exactly about Steven himself, but it was close. It turns out that CAB co-artistic director Sarah Herda had dreamed up a pairing in the initial stages of planning the Biennial. The result is a surreal performance by Jessica Lang Dance in collaboration with none other than New York architect Steven Holl. For 20 minutes at the Harris Theater on the northern edge of Millennium Park, "Tesseracts of Time" combined architecture and performance arguably the most potent way of all the Biennial's performances, as nimble bodies gracefully moved around and through stage sets designed by Holl. Lang took "a sculptural approach to this new work, utilizing visually arresting sets and costumes, enabling three-dimensional interactions with bodies and objects that evoke emotions and tangible sensation." The first act included a large, site-specific projection of a wooden model of Holl's Explorations of IN, which provided the backdrop for the experimental dance. 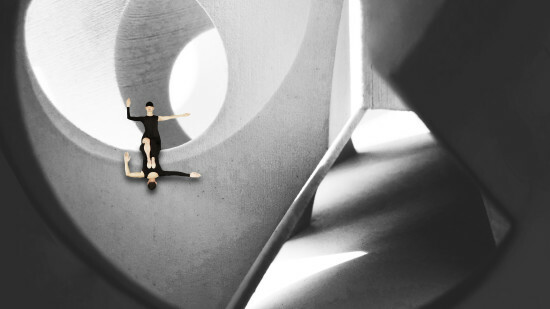 Dancers emerged on the screen, superimposed into the model at the exact scale as the real-life dancers below. 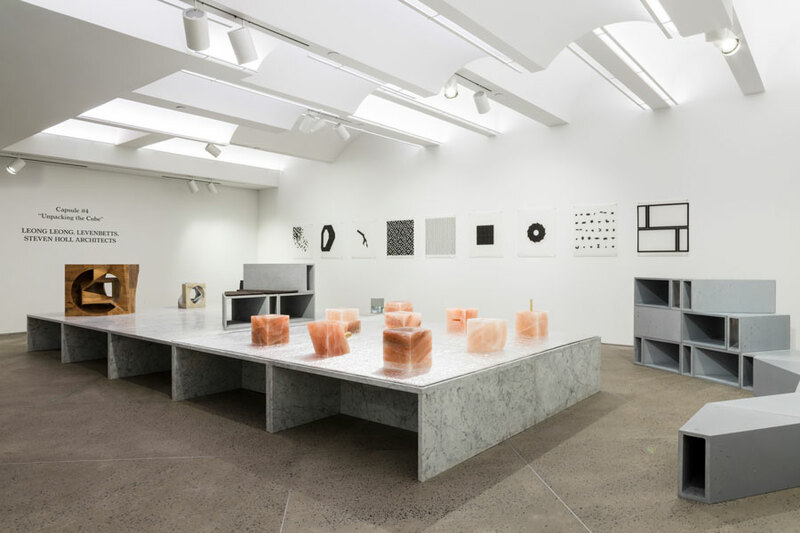 The music for the show was chosen based on material in "The Architectonics of Music," taught by Steven Holl and Dimitra Tsachrelia at Columbia GSAPP. It includes David Lang, Morton Feldman, John Cage, Iannis Xenakis, and Arvo Pärt. The real fireworks came in the second act when three fabric-over-tube forms sat on the stage, glowing white. The dancers moved in and through them, before the shapes were gradually lifted up off the ground. 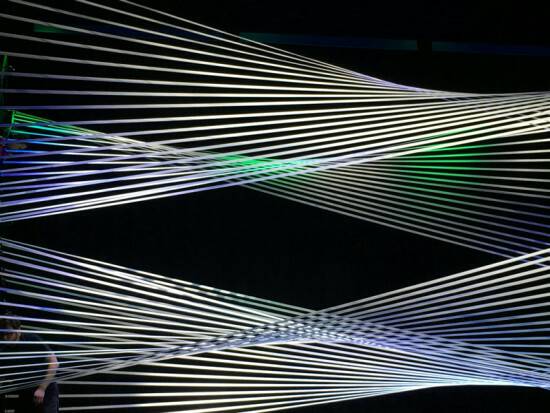 As they rose from the dance surface, colored lights illuminated the fabric forms from the sides of the stage. Tesseracts was based on the four seasons, compressed into 20 minutes. The colors of the backdrop and the hanging Holl forms changed in harmony with the changing of the seasons. https://www.youtube.com/embed/QlFxZfu-GRo For more architecture and performance, check out the discussion, "Building Blocks: Choreography as Architecture,” by Minneapolis-based choreographer Chris Schlichting and visual artist Jennifer Davis, at the Chicago Cultural Center. 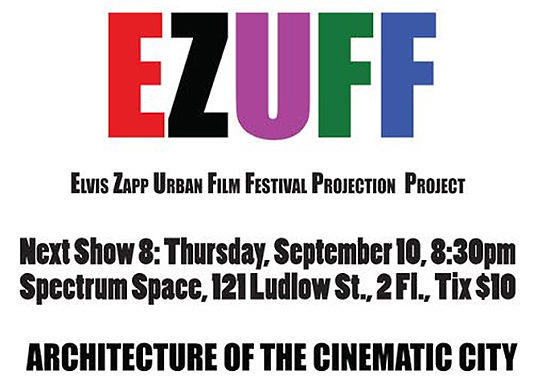 The Elvis Zapp Urban Film Festival Projection showcases short videos on architecture urbanism. The brainchild of Andrew McNair, the festival is unlike any other film event devoted to design—and it's not to be missed. McNair holds and open call for videos of a minute or less. He edits these and present his festival in a one hour format. Now, Elvis Zapp will join forces with Steven Holl’s 32BNY and troll through its archive of “didactic architecture and city videos“ and show them alongside those submitted to McNair. The next festival will take place in New York City on Thursday, September 10, 8:30p.m. at Spectrum Space, 121 Ludlow Street, 2nd Floor. Don’t miss it! 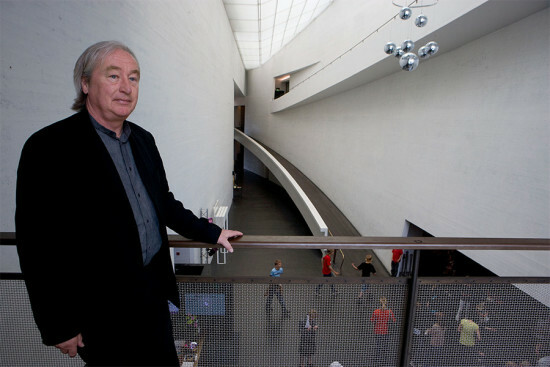 Eavesdrop> Holl-y Moly: Could there be a ballet about Steven Holl at the Chicago Architecture Biennial? The Chicago Biennial will not be short on architectural morsels, but the most delicious one could well be “a ballet about Steven Holl,” which sources tell AN will be held in a local theater. What exactly a “ballet about Steven Holl” means we are unsure, but here’s hoping that it stars Robert de Niro (a Holl doppelgänger) in his biggest dance role since his infamous “Twinkle Toes Shakespeare” role in Stardust (2007).